UCLA (4-3) travels to Seattle on Saturday to take on the Washington Huskies (6-1), who are coming off a bye week after being upset at Arizona State. This will be the first meeting between these teams since 2014. You can look for the Huskies to give the ball heavily to their dynamic duo of Lavon Coleman and Myles Gaskin. The Huskies will try to take advantage of the fact that UCLA gives up a PAC-12 high of 6.1 yards per carry. But don’t underestimate the Bruins defense because although they have been struggling they did improve against Oregon State as they held Royce Freeman and the rest of the Ducks rushing unit to four yards per carry. Washington’s quarterback Jake Browning (14 TDs, 3 INTs) wants to get back to form as the reigning PAC 12 Player of the Year as he takes on a Bruins secondary that is rated as one of the top three in the entire conference. One of the biggest questions for the Huskies is who will emerge as the number two receiving threat behind Dante Pettis. Could tight end Hunter Bryant step up after his big game against the California Golden Bears? or will it be Quinten Pounds who had huge plays against the Colorado Buffaloes? True freshman Salvon Ahmed could be the x-factor as he brings a lot of speed and athleticism that the coaching staff loves to involve in every game. Washington has a big bad defense that is top in more defensive categories than you can count, but it will be challenged by one of the most talented arms in the country in Josh Rosen. 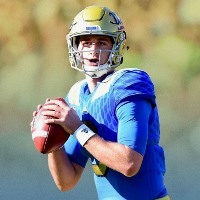 Rosen’s having one of the best years ever in his UCLA career as he’s passing for over 375 yards per game along with 19 touchdowns in seven games. The Huskies secondary has been depleted by injuries so don’t be surprised if you see Rosen end the game once again with over 350 passing yards and with 55 or more passing attempts as he lights up the Seattle sky. Don’t miss the action on Saturday at 3:30 ET. The line favors Washington (-1100) with the spread at -18 for the Huskies. The over/under is at 58 points.